Ruby -Fan Character- par light_james. Cedits go to the owner. I like her design plus she's kinda cute^^. (I just had to share). Don't worry Fubblegummers, I'm sure someone out there has already mada an offspring for Finn and Peebles. :). HD Wallpaper and background images in the Adventure Time club tagged: adventure time finn flame princess. 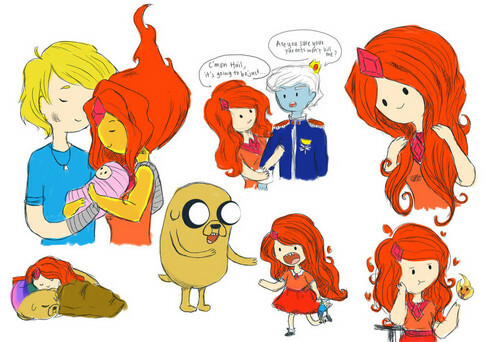 This Adventure Time photo contains anime, bande dessinée, manga, and dessin animé. That's cute :3 especially when Ruby was sleeping with Jake and Lady's child! But I think it would be nice if her hair was blond, like Finn..
Oh yeah, nice suggestion. But it's kinda cute the way it is <3~"